to the escape hatch! : Favorite Scene Friday! 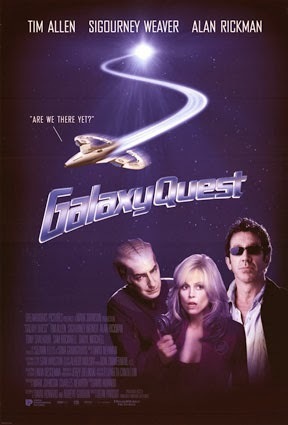 Galaxy Quest: "By Grabthar's Hammer..."
Favorite Scene Friday! Galaxy Quest: "By Grabthar's Hammer..."
We asked a few friends to help us celebrate Escape-athon and for this week's Favorite Scene Friday we're joined by none other than CT from the Nerd Lunch blog and podcast! I have a confession. I’m not much of a fan of comedies. And even less a fan of parodies. And when I'm a huge fan of the source material, I’m even less a fan of parodies. So when I heard they were going to be making a parody of Star Trek starring Tim "The Toolman" Taylor, I wanted nothing to do with it. But I happened to catch an interview with one of the stars on a talk show. I can’t remember the star or the talk show at this point. (Or maybe I’m too embarrassed to say that I think it was Regis.) After hearing more about the project and seeing a clip, I was suddenly not so put off by it. The cast wasn’t just the guy from Home Improvement, but also “Ripley,” “the bad guy in Die Hard,” and “the funny guy from Wings.” Not to mention the fact that it also had two stars that I would grow to love, but didn’t really know at the time (“the guy from Moon” and “Veronica Mars’ dad”). So, I wound up giving the movie a chance and absolutely loved it. While it was poking fun at the conventions (no pun intended) of Star Trek, it did it with reverence and intelligence. The strongest character in this film is probably Alan Rickman’s Alexander Dane. He’s a classically-trained Shakespearean actor who found himself on this absurd sci-fi show. Not only that, he’s the beloved, fan-favorite character who finds himself in a rut of writing. One particular line has followed him through his career and he can’t seem to escape it. This clip is actually the entire “Grabthar’s Hammer” subplot, but the best part in particular comes at the 54 second mark. When appearing at a store opening, he's forced to say the line again in a completely sold out manner. The amount of contempt he has for the line and himself is palpable. It’s made even funnier by the bearded store manager who is all smiles behind him. This shows off the range Alan Rickman has beautifully as it really all comes together when he says the line with deep sincerity while comforting a dying comrade.